I’m usually trying to keep the ears open – so it was slightly unusual to be handed a set of ear plugs when I turned up for the Royal Salute at Edinburgh Castle today. 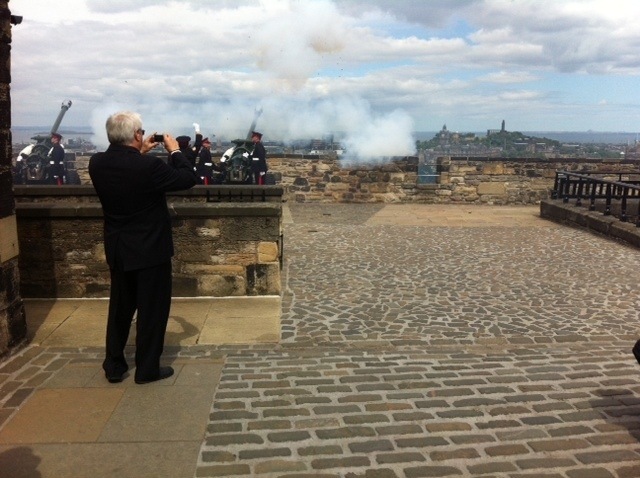 This is the 21 gun salute which marks the arrival of the Queen in Scotland on her annual visit. Their “blood sacrifice” was seen as Ulster’s side of a deal in which Britain would somehow “see the loyal province right” in the agonising over Home Rule which was sure to resume when the fighting was done. Just as interesting was a conversation about how in 1916 army leadership had failed to adapt to new and more mechanised patterns of warfare. Painfully they had to recognise that what had ‘always’ worked before no longer worked. Even to my 21 gun-deafened ears, that had a slightly familiar ring!